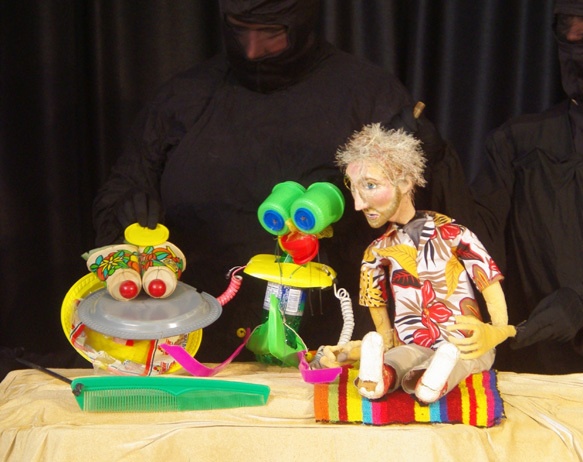 A puppet pantomime with live music! This show tells the story of someone who litters, throwing his garbage into the ocean. He falls asleep on the beach and has a dream. In his dream, the ocean turns to plastic and all of the garbage he has thrown in comes to life! When he awakens, he sees a sea turle swallow a plastic bag that he threw away. He jumps in to save the turtle. Once the sea turtle swims away, the man starts to drown. The sea turtle comes and saves him. The LOGIC is: If we save the earth, the earth will save us! All the puppets within the dream sequence were built from used plastic and other garbage. The ocean was built using plastic grocery bags collected from neighbors. Neighborhood children helped to put it together. Matthew Leonard: a puppeteer, with his own company, The Lionheart Puppet Company. 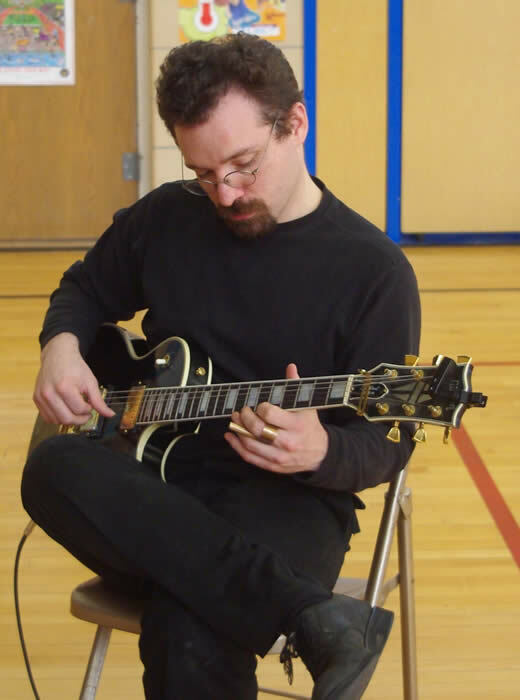 Frank Natter: composer and guitarist, and teacher with FaceArts Music in Essex, Connecticut. 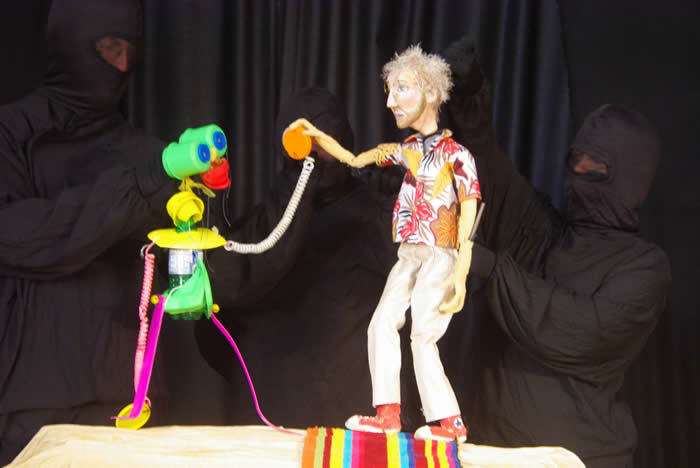 Sandy Bellock Listorti: puppeteer and artist. Elizabeth Wadsworth: dollmaker and puppeteer. Rolande Duprey: Director/designer for this project. Composer/Guitarist Frank Natter, Jr. provides the music live. Robin McCahill: puppeteer, felt and fiber artist, and unique bike fitter. Adelka Polak: a performance artist, with an interesting idea about Reinventing Your Pants. Drew Scott: director, actor and teacher. Several children from Purple Rock's immediate neighborhood. For additional research or information on topics that this play touches upon, see below. New article about a solution to the plastic in the ocean. 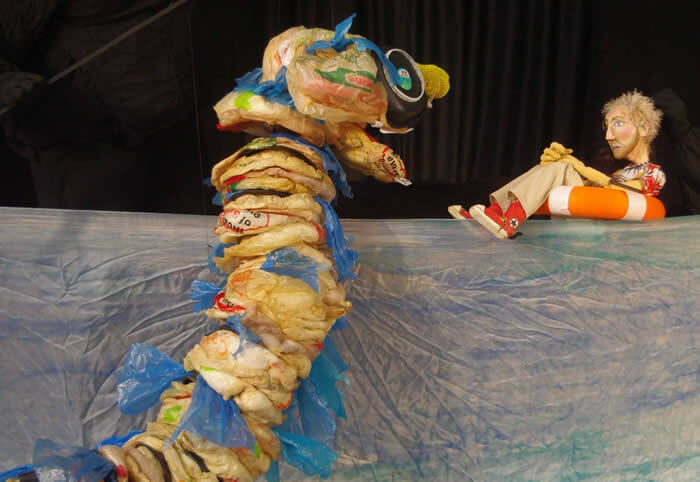 The "Plastic Soup" in the north pacific ocean, also called the Great Pacific Garbage Patch, is also a topic within our play. What to do with plastics? This article from the Seattle Times may give you some idea of the issues involved. Marine Debris: A program from the National Ocean Service's Office of Response and Restoration. The Long Island Sound Study: In our own backyard, there are actions we can take to keep our waters healthy. Plastic recycling article from Wikipedia.